A theorem of Archimedes on a circle can be generalized to parabolas as shown here. Vertical lines correspond to diameters of the parabola. 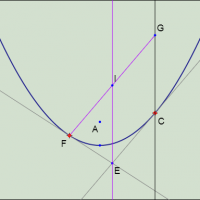 FG is parallel to the tangent at C. E is the intersection of the tangents at F and C.
Observe that teh vertical line through E bisects FG.